With a magnesium alloy dust- and splash-proof body, the Sigma sd Quattro Digital Camera is a durable and rugged mirrorless interchangeable camera that can take advantage of the full line of Sigma Global Vision lenses. It features an APS-C sized Foveon sensor renowned for its imaging characteristics, including sharpness of detail and nuanced colour tone, and the latest Dual TRUE III image processor. 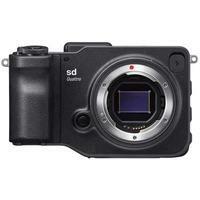 The highly-portable and fast-processing Sigma sd Quattro Digital Camera uses a two-mode autofocus detection system for speed and accuracy, and can produce images with exceptional dynamic range using its Super-Fine Detail mode.